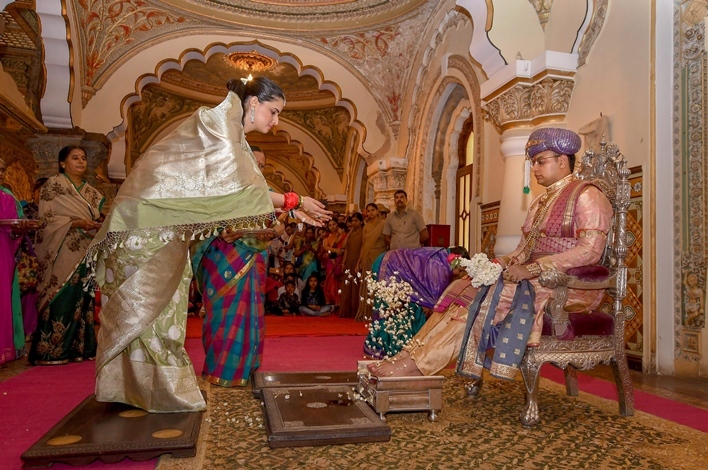 The Mysore Dasara or the Navarathri is a 10-day festival that falls in the month of September or October. Mysore Dasara is the “Nadahabba” or the State-Festival of the State of Karnataka, called as “Navaratri” meaning Nine-Nights, a 10-day festival, celebrated with utmost spectacle and joy in the city of Mysore. The Dasara festivities have a rich history of more than 400 years. During this 10 days festival, the normally calm and peaceful city transforms into a hub of celebrations and activities. Avail flight ticket to Mysore from Bangalore for just INR 999. Travel time would be 50 mins. Tickets can be booked through MakeMyTrip, Air India sites and Yatra. 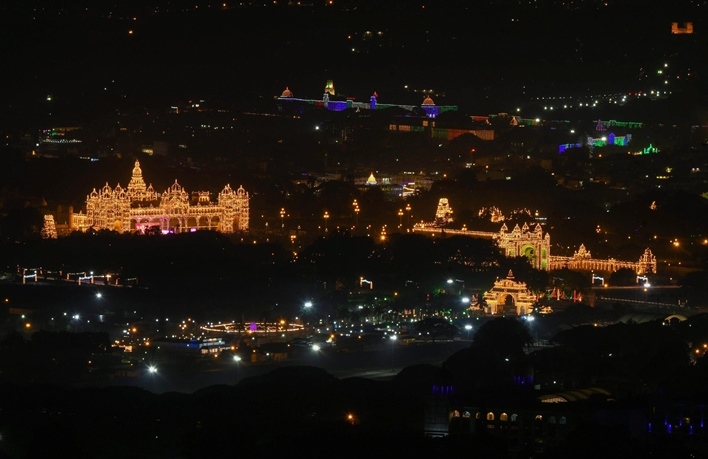 The Navarathri festivities start with the lighting up of the Mysore Palace with 100,000 light bulbs in the evenings for the duration of the festival. It takes place from 7.00 PM – 10.00 PM. There is a food mela that is organised in the Scouts and Guides ground. There are also various cultural programs held at the Mysore Palace, Jaganmohan Palace, Kalamandir, Kuppanna Park, Ganabharati, and Nadabrahma. On all the 10 days of Dasara, various music and dance concerts are held in auditoriums around Mysore city. Musicians and dance groups from all over India are invited to perform on this occasion. 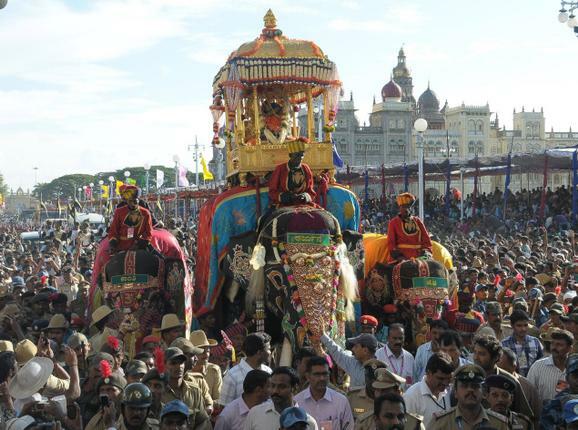 The Jumbo Savari (Mysore Dasara Procession) is held on the streets of Mysore city on Vijayadashami. It starts from the Mysore Palace and culminates at a place called Bannimantap. The main attraction of this procession is the idol of the Goddess Chamundeshwari, which is placed on a golden mantapa on the top of a decorated elephant. This idol is worshipped by the royal couple and other invited guests before it is taken around in the procession. Colourful tableaux, dance groups, music bands, decorated elephants, horses, and camels form a part of the procession. After the Jamboo Savari a torchlight parade takes place in the evening at the Bannimantap Parade Grounds. Another major attraction during Navarathri is the Dasara exhibition which is held in the exhibition grounds opposite to the Mysore Palace. This exhibition starts during Dasara and goes on till December. Various stalls which sell items like clothes, plastic items, kitchenware, cosmetics and eatables are set up and they attract a significant number of people. A play area containing attractions like a Ferris wheel is also put up to provide entertainment to the people. Various Governmental agencies put together temporary stalls to highlight the achievements and projects that they have undertaken. The festivities take on the mantle of the state festival – the nadda habba – and are attended by people from not just in Karnataka, but attract tourists from around the world.